So I went looking for another job, and it wasn't long before I found one at Crump Motors on 16th Street. I forget how I found that job. I think I went in and asked for it. I didn't think much of the place because although it was busy as hell--they had eight or nine mechanics working there--it was dirty as hell. They had no place to change clothes. Everybody came to work in their dirty, old working clothes. Nobody came dressed up like I did. You know, clean pants, clean shirt, and then I would change into my overalls. But they had no place for me to change clothes. I couldn't change in the bathroom because it was too filthy to leave my clean clothes hanging in there all day long. The only place I could change was in the office, so I hung my clean clothes in there. I had to use newspapers as shades on the windows so no one would look in while I was changing, although it took me only a few minutes to change my clothes, real quick. Anyway, those were the working conditions at Crump's. I stayed there a week and couldn't take it anymore, so I took a day off, called in and said I had something to do, and that I'd be in the next day. They said OK. I went looking for another job. But the only thing I could find was something worse, so I decided to go back and work it out. I stayed there for 13-1/2 years, and that's a pretty long time. Happily, the working conditions improved as time went along. We had a pretty strict boss, Guy VanDoren. I liked him because he was firm in his convictions. Whatever he said went, and he knew his business. He was really a good boss. Nobody put anything over on him, and he treated me fairly. So I stayed with him for 13-1/2 years. The last 3-1/2 years, our shop foreman, Ed, got cancer of the mouth, had an operation, and couldn't come back to work because of his facial condition. It was sad to look at him, and pitiful. So Guy VanDoren and Mr. Crump got together, called me over one day and asked me to take over Ed's job as the shop foreman, or assistant manager. I said I thought that they had better people working there, some of them working there longer than I. Why didn't they choose one of them? But Guy and Mr. Crump knew that I was more capable of doing bookwork and paper work, and making out bills and things like that. My handwriting at that time was very good, just like Mr. Crump's. Guy's was bad, as was that of most of the other help. The other mechanics couldn't write or spell or do much math. But many of our customers remarked about my penmanship. Today my penmanship is not as good as it was when I worked at Crump Motors. Now it's sort of fair to middling, about "C" average. But with three glasses of wine in me, my penmanship quickly comes back to normal. The wine seems to release the tension in me, and I become more relaxed. I remember during my school years, I would love to write and would practice my penmanship every day. I would started out making continuous ovals, then push and pull, in and out of the circles. Always remembering to keep my three fingers resting lightly on the paper. Pen held correctly in hand, wrist flat on the surface and free to slide as I wrote. No finger movement like now. This penmanship technique was by order of our writing teacher. That's why I wrote so well over all these years. But anyway, Guy and Mr. Crump wanted me because I could estimate jobs and figure out work schedules. I had worked there so long that Guy and Mr. Crump knew all about me and knew I could do the job. So they asked me to take over Ed's job, and I did. I don't know whether the other mechanics liked it or not, but I got along with them OK. I used to pacify them, you know, try to make them feel good. If they wanted something, I'd get it. I'd help them in any way I could. I got along pretty well. I was pretty well liked there. When I retired they had a big blowout for me. I forgot what Mr. Crump gave me. Was it $200? Something like $200 or $300 as a bonus. But we used to get a bonus every year for the last five or six years I was there. It was three percent of your annual income. Sometimes you would wind up with a couple hundred dollars, which wasn't bad. Once in a while they would give you a supermarket gift certificate or things of that sort. But anyway I liked it there. Guy, as tough as he was, did a lot of favors for me. If I asked him to do something for me, he would follow it up right away. Like the time he helped me with my sunburn problem. When we lived in New Jersey, we loved to go to the beaches with Jule, and Jim and Anne, and Millie and Sal. We would all pile into a car and go down to Point Pleasant, and spend a weekend there. We use to enjoy the sun. I loved the sun. One Labor day weekend we were there, and I was out in the hot sun for two days and didn't realize what I was doing. My face got really sunburned. I really suffered with it. Months later I sometimes couldn't even shave. My face was all scaly. It took me more than a year to get rid of it, and I still feel the effects of it even today. My chin seems to get a little red once in a while, like a burning spot on it. That's where the burn was concentrated, on the lower part of my face. I was taking special medication for my face while I was up north, but I couldn't buy any more of it, because it had to be prescribed by a doctor. I remember the name. It was called Tera-Cortrill. After moving to Florida, I told Guy about it once because my face was getting red. I explained how I couldn't buy this medication anywhere except with a doctor's prescription, and asked him if he could get it for me. He said he'd see what he could do about it. He was pretty friendly with a drugstore owner whom he dealt with a lot. Well, you know, it wasn't a couple hours later that he came back and said, "Here's your medication." He had talked to his friend, the druggist, and had managed to get me a prescription of Tera-Cortrill, and it really helped. As soon as I put it on my face I got rid of the irritation. Of course, Guy has done many other things for me. Like the time he gave me a toy truck for Michael III. It seems Guy had a nice toy truck, a toy gas truck. You would put a few drops of gasoline in it and away it would go, any place you wanted. I said, "Guy, that's a nice little toy." He said "They are worth $25. 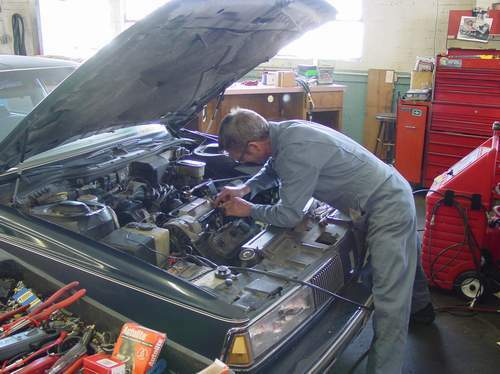 I got it free because we bought so many parts." In those days, the parts house would have a sales promotion so that if you bought a large enough quantity of parts, like $100 worth of oil filters, they would give you a free toy. I said "Do you think you could get another one?" He said "No, they only give you one per order. You'd have to spend over $100 in parts to get one of these." But, you know, the very next day he called me into his office and said he wanted to show me something. I was wondering what he wanted, when he reached under the counter and pulled out this toy for me, and said, "Here." I said, "How did you get it?" He said, "I just wheel and deal. That's all." But anyway, that was another big thing he did for me. The last I heard of him was about a year ago, he gave me a call here at the house. He called and said, "Hello, do you know who this is?" I said, "No I don't." He said, "This is Guy. Guy VanDoren." "You son-of-a-gun," I said. "Where are you?" He said, "I'm down at Frank Crump's." I said, "What are you doing?" "Oh nothing," he said, "I'm just sitting around. I'd like to see you. Why don't you come up and see me?" He lives in Crystal River, which is about 60 miles north of St. Petersburg, in Citrus County. I told him, "Guy, I never get up that way." He said, "Come up. I want to see you." So I asked how his wife was, and she was fine. He still fishes a lot because that's why he moved up there. I guess he's doing pretty well. This was right about Christmas time in 1987, when I was talking to him, so I said, "Hey, You've got a birthday coming up on January 4th." He said, "How do you know that?" I said, "That's not the only thing I remember. I remember your birthday is on January 4th, because mine is on the 1st, and you are a year older than I am. That's how I remember." He said, "I didn't think anybody would remember." So he said, "If you are ever around Crystal River, come up and see me. I'd like to see you again." So that's the feeling you get from people, they either like you or they don't. And, of course, Mr. Crump liked me a lot too. He used to trust me with the cash register. One time I was $5 short in the register, and he said, "Don't worry. Guy's always $5 or $10 short. I always allow a shortage of $5 in the cash register. I know you didn't take it." Anyway, it was nice that they trusted me. I hated to leave Crump Motors, but Jule said I should retire. As always, I listened to her wisdom and she was usually on target. I was 63. So I retired.